At Bossio Painting & Decorating, we handle a wide variety of projects from both residential and commercial properties. We specialize in interior repainting jobs. We have worked in small apartments, average-sized houses, condos, office spaces, luxury homes and more. 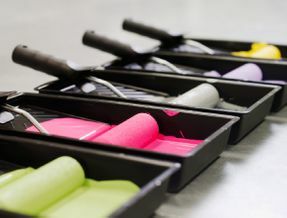 When it comes to your painting project, you have a choice of which type of high-end paints we use on your home or business. Customer satisfaction is our number one priority. That’s why we guarantee all of our work and take the necessary time to pay attention to details such as repairs before painting. At Bossio Painting we feel that your satisfaction is our biggest source of advertising. Repainting is a great way to show off that latest home improvement project. If you’ve been renovating an old bathroom or updating that old kitchen, a fresh coat of paint can finish the job. Repainting can provide a cleaner, brighter looking room. We can transform that out-dated and dull space into a more inviting one. Ask about our repainting services today.